SAINT PETER, MINN. – The Gustavus men’s basketball team played host to Saint Mary’s on Saturday and fell by a score of 86-81. The win for the Cardinals moves their record to 5-3 and 2-2 in MIAC play and gives them their first victory in the Lund Center in Saint Peter since it opened in 1984. With the loss the Gusties fall to 3-5 overall with a 1-3 mark in the conference. From the get-go, the Gusties held an early edge when Nolan Malo (Fy., Owatonna, Minn.) hit a three pointer to put the team up 7-5 and they would hold a lead over the Cardinals for a majority of the first half. Saint Mary’s took the lead on Gustavus late in the half but the Gusties closed the half out on a 9-0 run, capped off by a Spencer Tollefson (Sr., New Richland, Minn.) buzzer-beating three pointer to hold a 38-33 advantage at the break. The Cardinals came out of the half with a renewed energy and took a 49-48 lead that they would hold onto until the Gusties battled back and took a 67-66 lead. They didn’t hold onto it long though as the Saint Mary’s hit four three’s in the next two and a half minutes and then made a layup to take an 80-76 lead with just 1:43 to play. The Gusties got a few buckets late but the visitors knocked down all six of their free throws down the stretch to take home the victory. In the second half alone, Cardinal sophomore Eli Cave poured in 27 points, including 4-5 from three and hit some crucial shots to help guide the Cardinals. After shooting just 35.1 percent in the first half as a team, Saint Mary’s shot 54.3 percent in half number two and knocked down eight three pointers to propel them to a 53 point second half effort. 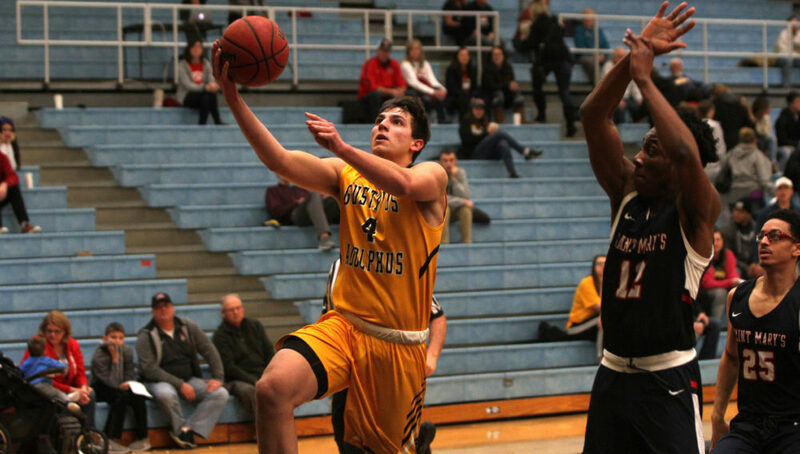 The Gusties were led by Malo who had 24 points, shooting 7-10 from the field and he also corralled seven rebounds. Tollefson also had seven rebounds as well as 11 points for the home team. Riley Sharbono (Sr., Marshall, Minn.) kept his solid play going as he tabbed 18 points on the afternoon. After shooting 46.7 percent in the first half, the Gusties shot 56 percent in the second half but couldn’t get enough stops on the defensive end to secure the victory. In the game Gustavus had a season high 22 assists, but they also turned the ball over 13 times compared to just five from Saint Mary’s. The Gusties will next be in action on Wednesday when they travel to St. Olaf for a 7 p.m. contest.